The big brother of the 1501C is the SWF E-T1501T. It has the same 6.4 LCD control panel, 15 needle expansive head, and Quick Change Cap System. The “T” stands for Table. This SWF E-T1501T has an adjustable table that you can move out of the way if needed. For Heavy items, like leather jackets or draperies, just move the table up. The SWF E-T1501T is a standard size commercial machine with space saving features compared to similarly equipped products and is blazing fast, running at 1200 RPMs. Backed by the SWF 7 year limited warranty and 3 year Electronic Components warranty, you can purchase the E-T1501T with confidence. Remained memory capacity dsiplayed on screen. Various formats of design saved in USB memory, CF Card, may be automatically recognized. Frame Semi-Auto Sensor [Hoop Select] Select the desired frame (SQUARE, ROUND) in the menu, and the frame limit suited to the outline of the frame is set. 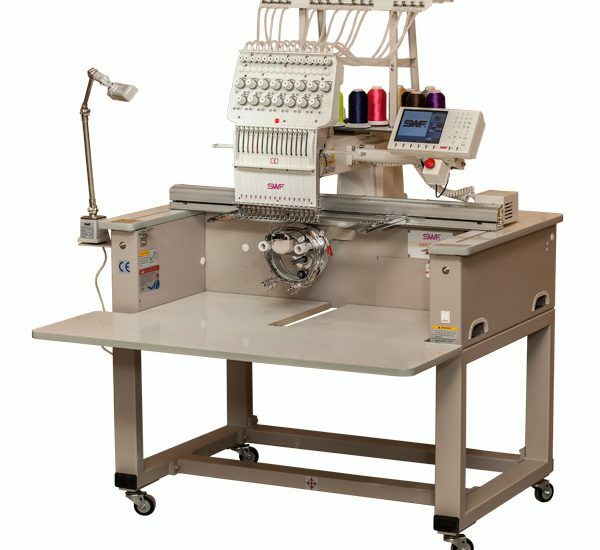 It always produces an error before interference with the frame during subsidiary work or embroidery work to prevent trouble.